I had an bluetooth audio device (Bose SoundLink Wireless Mobile speaker) remembered on my MacBook Pro running OS X 10.8.5. Now I don't have it anymore and I want to link it with another audio device and it seems to be unable to forget the Bose one and link with my current device, how could I erase the Bose device? 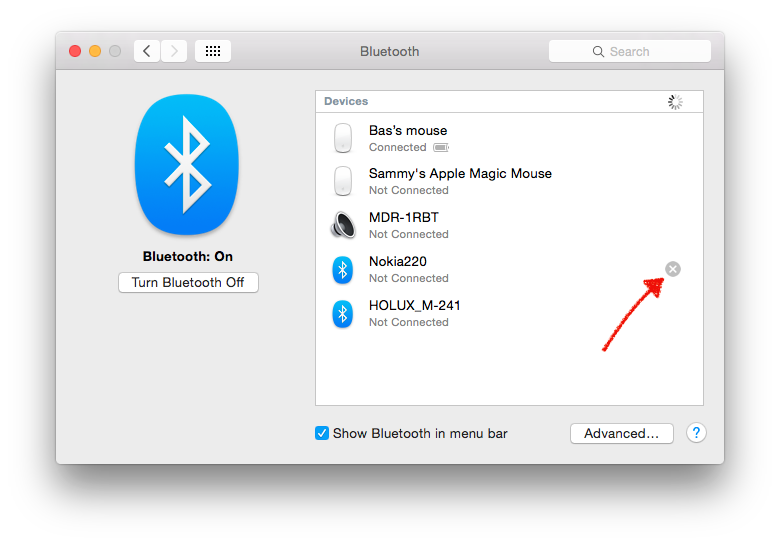 In System Preferences > Bluetooth, make sure that Bluetooth is on and the Show Bluetooth in menu bar check box is checked. Then hold down alt or option before clicking the Bluetooth toolbar menu icon. Now, in the device's contextual menu you can remove it. and reboot. This will remove all bluetooth devices and you can then add the ones you want back by pairing them again. I wouldn't recommend this option if you don't understand clearly how to delete the file and how to pair devices. In other words, don't do it unless you know what you're doing. Go to System Preferences > BlueTooth and you will have a list of the devices remembered by the Mac. When BlueTooth is on you can select one and then at the right of the selection will be an 'X' icon. Click on it and the item will be removed from the list. For reasons that escape understanding you can only do this when BlueTooth is on. Not the answer you're looking for? Browse other questions tagged macbook mac bluetooth . 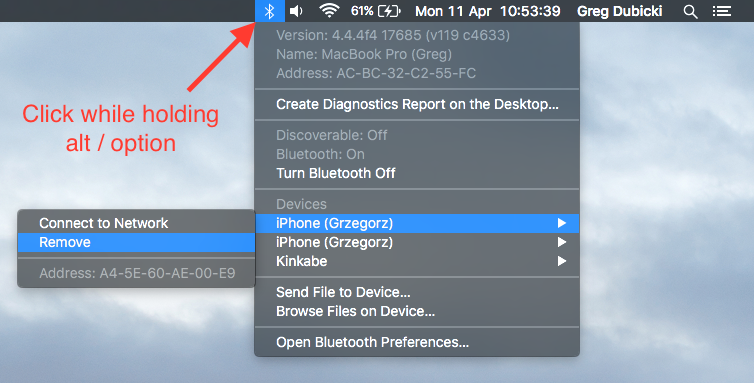 Why do my Macbook Pro's WiFi speeds drop significantly when paired with Bluetooth devices? How do I connect my Bose QC35 with my MacBook Pro under iOS? Why is my MacBook bluetooth no longer connecting to Bose AE2 SoundLink headphones?